Returning home from your voyages you find your homelands have been invaded by the unholy inhabitants of the Nethermist and has setup camp in crypts and dungeons all across the lands. Wander through the lands and bring down the vengeance of your Lords unto the unclean monsters in a turn based rogue-like set in a gorgeous board game setting. Turn based gameplay rich with choices and opportunities to screw up and die. Face hard choices about which of the 1000’s of cards you find you will want to keep and which to discard. Don't get too attached to any of the cards as they deteriorate with use and will need to be replaced! Save the soul of the lands and crush the hordes of the Nethermist! Fight 40+ enemies each with their own unique skill cards that they will use to end your short life. Learn their strategies through multiple play-throughs and learn to be one step ahead of the creatures rising from the Nethermists! When Crusader falls, try to reach the same level again to retrieve all gold and items you lost. If you perish on your way there a new marker will be set and previous loot will be erased and replaced with what your carried on this playthrough. Card Dungeon saves automatically after every turn, so you can always turn off the game and get back to exactly where you started when real life calls. Cloud saves allow you to take your unlocked trait cards and gems with you to any computer you play on. There are so many cards to find. So many. There are skill cards which you use to interact with the world, attack monsters, disable traps, and more. There are also trait cards which define your character. There’s cards that equip your character with armor, weapons and magical items. All of these interact with each other in different ways so planning and strategy are your best friends. 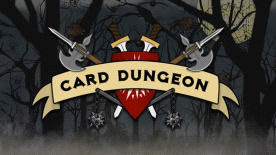 Card Dungeon is a board game in digital format. If you play board games you’ll feel right at home with Card Dungeon. Explore the numerous dungeons, slay the monsters, collect the loot.